This is quite a long post. I thought about doing a shorter companion one, but I’m just going to teach to the top! 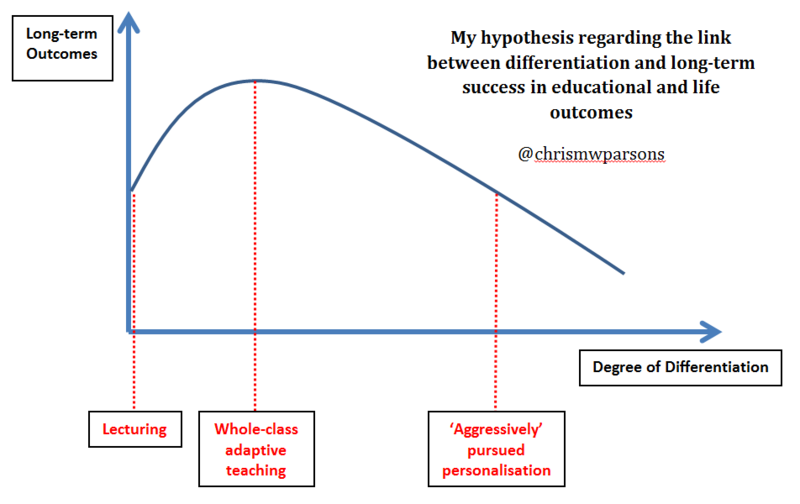 In this post I want to tackle what could be described as an ethos of ‘aggressively pursued personalisation’ which I believe haunts the otherwise beneficial concept of ‘differentiation’, and through multiple ways actually harms educational outcomes. In the process I’ve tried to make my case rounded enough to be of use to those who feel troubled by such a situation in their school. ensure that persistent special educational needs are compensated for. As you will see at the end, I do think we can have all of these things in a way which feels coherent, naturally powerful and manageable for teachers, and which creates the best long-term outcomes for our pupils. To build this point I’m going to pull together multiple strands of thought about differentiation before proposing several additional ways of looking at the matter which I’ve not really seen elsewhere. I’ve recently rescued a tree which was being strangled by our front hedge. Ever since we moved here it’s looked a mess, and in the summer the separate parts are hard to distinguish. The hedge part is evergreen but the main tree isn’t, so I grabbed the opportunity to cut the hedge back while everything was more obvious. I’ve now realised what an excellent shape the main tree really has! Above and beyond children with persistent Special Educational Needs, the fact that every child is unique means that in any mainstream classroom, even setted ones, you should be seeking to create 3 or more streams of differentiated activities and this should theoretically persist no matter how small your class gets. If you’re not doing this, then many of your children will not be learning as well as they could be. What kind of heartless teachers wouldn’t aspire to take account of all this…?! Now, I know I’m not alone in rarely feeling completely at ease with the implementation of this. It’s always managed to make me feel inadequate one way or another. Indeed, it almost feels like it is designed to make teachers feel inadequate – that there is always more that you could do if you were good enough – no matter how hard you try. All over the internet and the publishing world are attempts to rescue teachers from differentiation angst – to make the whole thing seem a little more manageable. They all bring something of use, but even so… I can’t escape the thought that there’s actually something fundamentally wrong with the dominant philosophy; something which has grown up so tightly amongst its branches that it seems invisible to us, but that – if we could just identify it and strip it out – then we could gain a guilt-free skip in our step and a genuinely fruitful pedagogy. some additional propositions which for me seem to fully clarify matters. There is perhaps a tacit sense in some circles that great differentiation is like a martial art; something which is the pinnacle of teaching. I can easily imagine a school where teachers swagger through the saloon doors of the staffroom with their “7th Dan in Differentiation” badge on their chest and their “I once had 14 different activities on the go at once” mug waiting proudly on the shelf for them. Practitioners such as Carol Tomlinson would swear that it genuinely can be done to a very high degree and that it is our duty to endeavour to do so. Then allied to this is the ‘gift-bag’ approach to helping us out with differentiation (see Mike Gershon’s “How to use differentiation in the classroom” as an example of this), which basically tries to equip us with enough ideas of activities to be able to generate the required amounts of differentiation without having to always create multiple levels within the same activity. What I think is useful about all this is that it challenges us as teachers to continue to work at our professionalism and knowledge of teaching strategies and pupils rather than being complacent. I do think we should keep alive a thirst and drive for improved mastery, so the sentiment isn’t all bad – even if in this case I think it is misguided. One approach here is to stop focusing on all the many things you could theoretically be doing (“Well, I have to ensure that there is extension and support and multiple forms of engagement, presentation of materials, relevance to the pupils… etc. etc.) and look to the very heart of what you want to achieve. The following seems to have fruitfully caught on: “Differentiation is giving everyone hard work that they can do”. This manages to pithily include the idea of support and challenge for everyone and can be a clear anchor point. I do like this approach – although, as you will see later, I think it can be refined slightly. Also, even with using this as a better starting point, teachers can still consequently run themselves ragged trying to chase up all the things they think should be included to make it come together. Again, I think this approach can be helpful – finding focus techniques to concentrate our differentiation efforts. I can certainly see the huge power of ‘choice’ for example, if used judiciously, as it helps with the engagement side too. But you’ve got to get the range of choice just right to make the challenge fruitful in intensity and direction – what I call “Goldilocks Zone Choice”. Solution 4 – Realise that differentiation can happen over extended lessons. The reality is that much topic teaching, and indeed any powerful learning, requires multiple lessons and repeated exposure in a variety of forms. If you use a mixture of overlapping, contrasting activities over a period of time, then everyone gets a richer experience and sufficient routes can be created into a subject to accommodate a variety of needs. With this vision, resources such as Mike Gershon’s volume of multiple activities start to become particularly useful. At first glance, some of the activities don’t seem like obvious differentiators in themselves to me. However, when strung together as a sequence, you can visualise different learners being accommodated. Solution 5 – Shift the focus of how you could differentiate. “Teach to the top, support at the bottom”. What if we reduce the three levels of differentiation to two? Instead of teaching to the middle, with extension and support opportunities, we could focus the teaching at the top end, ensuring that there is definitely enough challenge for everybody, and build-in support scaffolds to get everyone up to it. Again, this simplifies the task of planning significantly, though it also requires buy-in to a unified set of learning goals for a given group, and not separate objectives (not a bad thing in my mind as you’ll see). Observation 1: You might actually progressively weaken children. By changing tasks to make them more ‘appropriate’ for individuals you might mistakenly deprive them of opportunities to succeed at challenges. Matt Roberts vividly recalls a lesson where he’d planned reinforcement work for some children based on the previous lesson and not intended to involve them with the new stuff. He included them in the introduction to the harder stuff anyway, only to find that this follow-on concept made the previous stuff ‘click’. Are we really being as omniscient as we think when we judge that a particular child – or a designated group of children – should be deprived of what the others are doing? Observation 2: A difference is only a difference if it makes a difference! Do we overplay the differences between learners and underplay the similarities? All children are like everyone else, somebody else and nobody else. If we’re going to make assumptions though, perhaps we’re on the safest ground assuming similarities, rather than going out on a limb regarding the significance of their differences. This starts to get to the heart of my concerns with ‘aggressively pursued personalisation’. We actively seek to spot and bring to the fore differences between children, perhaps creating self-fulfilling prophecies in the process. Observation 3: The best differentiation is done in the teacher’s head. In all the ways we act and react to pupils we are constantly differentiating as we deliver a lesson (if we know our children pretty well). A corollary here worth remembering for lesson monitoring purposes is the fact that trying to make differentiation visible for an outside observer, particularly in your planning, is something separate from actually differentiating. Linking this with the previous observation: The planning element of differentiation should focus on preparing the ground for differentiation to take place as the need arises, NOT necessarily planning ahead when and to whom the differentiation will apply. Observation 4: Differentiation actually doesn’t work anyway… As Harry Webb pointed out in January on his now sadly closed-down blog, there is no actual research evidence that differentiation improves outcomes. In a more personal vein Matt Roberts observes that in all the supply work that he’s done, where he doesn’t plan any differentiation, the children all seem to rise to things remarkably well. But… how can this be? Surely by paying the most attention we can to individual needs we should be educating children better? Is it just possible that the ideology that we should focus as much as possible on personal differences actually undermines education at least as much as it furthers it? I have a hypothesis that differentiation improves teaching up to a point, but if aggressively pursued, actually harms longer term outcomes. Proposition 1: We don’t really know what we’re doing. Having fuzzily conceived the long-term goals for our individual, we can’t prescribe with real precision what the best string of learning experiences will be to achieve them. What were the key elements which have made me who I am now…? With every passing year I look back with a different perspective. Again, having fuzzily arrived at some idea of desirable learning experiences, we can’t for certain know what learning objectives will cause these experiences to arise for any specific individual. What were the key decisions which brought about my key learning experiences…? Mine? Someone else’s? Circumstantial? Also – in weighing-up the state of any individual pupil as they are now – we can’t accurately judge, in a given instance, just how their unique life circumstances prior to this moment have primed them for the best next step, and how they will respond to a new day and a new lesson. I keep finding myself surprised with how I myself respond to things on a day to day basis, so why should someone else be more certain? Now, it could be argued that I’ve just undermined any point in trying to make any decision to teach anybody anything! Not at all – as I’ll explain a bit later – but I have attempted to undermine the notion that in the grand scheme of things, we could consistently plot distinct differences in the educational paths of individual students, and expect this to represent wisdom. Of course sometimes the situation is far clearer than others, hence why my hypothesised graph shows an improvement in the initial stages of differentiation. There are situations where you can make a pretty good judgement, in advance of a lesson, how a child or group of children would benefit from a different kind of provision to the rest. This might either be due to the stand-out needs of the children being more extreme, or because the educational priorities had been made much clearer due to impending exams etc. Elsewhere I’ve written about needing to educate for the World of Necessity as well as the World of Opportunity. Unintentionally, the active pursuit of personalisation works to strip incidental adversity from the educational lives of pupils. In the process of doing so, this arguably undermines their development as emotionally resilient human beings. The prominent calls recently to actively teach character in UK schools are interesting. It’s as if all the ‘fibre’ has been stripped out of the educational diet in our efforts to make ‘processed carb’ learning objectives which gain rapid entry to the intellectual bloodstream. All our efforts to bend the curriculum to meet the child where they are, so as to make for easy engagement and agreeable learning objectives effectively prime children for a life which doesn’t exist in the wider world. We cannot ignore the possibly vital conditioning for the necessities of life which can be provided by children sometimes feeling out of their depth, needing to struggle, being treated as just one of many, and even feeling bored and needing to generate their own line of interest in a subject area. Perhaps then, my biggest reservation about the ‘giving all learners hard work that they can do’ definition of differentiation is that, sometimes, not being able to do something might be the route to the most important long-term learning. Teachers teach most inspiringly when they know and love their subject and have an uncompromised, favoured channel down which to lead their students. They instinctively sense their personally strongest way of bringing concepts alive and should initially come at planning lessons with this perspective high in their minds. Along the planning route, they need to then see clearly the possible obstacles to a pupil coming with them on this preferred journey, and the expanding opportunities which could be offered to pupils along the way, but if they are routinely expected to plan a mixture of channels, then their most instinctively powerful teaching will be compromised. Proposition 4: Pupils prefer to learn as part of the group. Sometimes children like to be different. Most commonly though, in mainstream classroom situations, they feel more comfortable and work better when they are ‘part of the pack’. As a matter of principle then, only treat them differently if both the administrative and emotional downside of doing so is clearly more than compensated for by their longer-term learning outcomes. In my opinion, there are fundamental flaws with the idea that the more we seek to personalise schooling then the better we educate our children. Nevertheless, this idea seems to exert a stranglehold on the otherwise important concept of differentiation, and push it beyond being a learning enhancer into being a stressful pressure on teachers of dubious educational benefit. Establish the most powerful learning objectives to achieve the goals of your programme of study. Use your knowledge of the subject to settle on what you consider the most naturally inspiring and effective ways of getting learners to achieve those objectives. Ensure that the route to overall mastery of the learning area includes multiple forms of exposure to, and engagement with, the subject matter, for every learner, over a period of time. Identify flexible opportunities along this route for any learners to extend their learning and degree of challenge. Using your knowledge of the subject and the learners in question, anticipate what obstacles could get in the way of reaching those objectives. Instigate means to ensure full access to your lesson for learners with stable, identified special educational needs, but aim to keep the ‘pack’ together. Plan the forms of general support which could be utilised by any learner to overcome obstacles if and when they arise. Approach every lesson prepared to create the best whole-group forward momentum towards your goals. In lessons, use knowledgeable and flexible teaching techniques to ensure that all pupils engage in beneficial challenge, in pursuit of your common goal, smoothly accessing support and opportunities as it becomes appropriate. If short-term learning gains are not apparent for pupils, ensure that they can embrace a sense of the challenges which they have engaged with, and the potential long-term educational benefit which they can derive from this. I think the main, hopeless flaw in the kind of differentiation you outlined at the beginning is its implications for teacher time. In effect, it means trebling (or more) the number of lessons that one plans – and no matter how desirable, that is simply not a realistic, sustainable proposition over the medium or longer term. Luckily, as you point out, there are other approaches, though the extent to which they would satisfy the purists, I don’t know. You also hint at a very handy symmetry – that of desirable difficulties. Could it not be that the bits of any one lesson that a particular pupil finds difficult simply represent a very neat way of presenting them with their own, customised desirable difficulties? 😉 And I completely agree with your analysis of why it is important that children do not come to think that the world revolves around making their own individual lives as convenient (and unchallenging) as possible. Finally, teachers have had a means of differentiation available to them since the year dot – and any worth their salt will use it all the time. It is called ‘conversation’. As I walk around my classes, I observe the work that children have done – and I know most of them well, particularly the older ones where this is most important. And I simply ask them extension questions, feed them titbits of further information, and point out things they could consider differently. Sometimes, I will ask them to add these in. I occasionally even give them something entirely ‘left-field’. What could be more efficient than that??? Thank you for taking the time to read this IJ – it was pretty weighty! Thank you also for your observations – thankfully going with the flow of mine 😉 I particularly like the way you summarised the position of the desirable difficulties – I wish I’d worded it that way. It would be lovely if this kind of thinking could break-out a little more – particularly into the realm of the inspectors! “Keep the pack together” – absolutely. For me, this is the key argument. My teaching is more effective if the whole class has a common experience and common language. This can’t happen if students are deliberately being kept apart. As you rightly point out, differentiation can take the responsibility to work hard and catch up away from the pupils, and reinforces a fixed mindset. It’s not the workload that puts me off excessive differentiation – it’s the feeling that I am doing a worse job. Thank you so much for your comment – it does indeed seem to hold a lot of power – the ‘united group endeavour’. I think that in modern teaching we have lost sight of the power we have, as teachers, to influence. It is common to just view the teacher as a ‘facilitator of learning activities’, ideally bringing forward as soon as possible the kind of independent learning which we hope our students will continue to do after school. I think one of the most striking examples of this that I’ve seen was a teacher on the internet a couple of years ago who described herself as being rather like a ‘hostess at a party – passing round selections of learning activities for students to choose from’. The teacher is a source of inspiration, clarity, and conceptual ‘gel’. We shouldn’t underestimate that power to influence the formative mind of a child.